Woodbridge, VA---The Potomac Nationals are excited to announce that RHP Tyler Mapes , RHP Sterling Sharp , RHP Wil Crowe , C Tres Barrera , SS Carter Kieboom , and 3B Jake Noll have been named to the 2018 Carolina League Mid-Season All-Star Game. 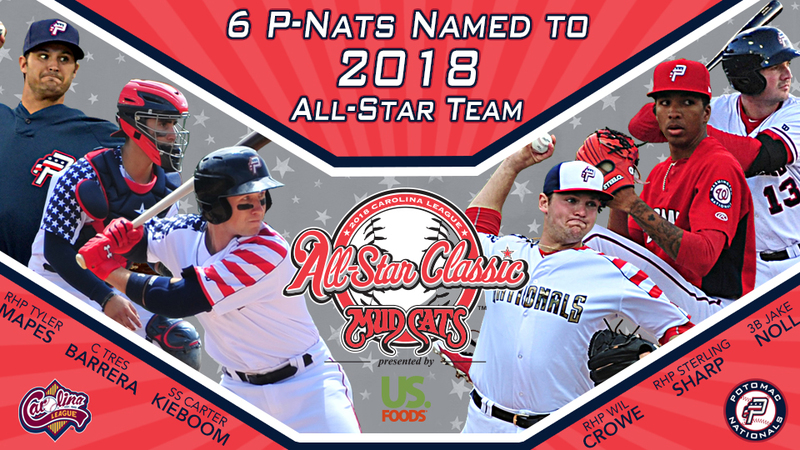 The six players will represent the P-Nats and the Northern Division in the 2018 Carolina League All-Star Game, presented by U.S. Foods, at Five County Stadium in Zebulon, NC on Tuesday, June 19th. Potomac's six representatives selected for the All-Star Game are the most by any team in the Northern Division, and tied with the Down East Wood Ducks for the most with any team in the Carolina League. After he missed all of 2017 due to injury, RHP Tyler Mapes has shown that he is back to form in his second go-around with Potomac. The veteran of the Potomac pitching staff has been one of the most dominant starters in the Carolina League over the first half of the season. In his first 11 starts of 2018, Mapes has gone 5-1 with a 2.04 ERA. Of all qualified starters in the league, Mapes has the third best ERA, behind Cameron Roegner and Trey Supak, both of the Carolina Mudcats. Mapes has not allowed more than three runs in any start thus far in 2018, and has allowed just one total run over his last three outings. Mapes was named a Mid-Season All-Star with the Harrisburg Senators in 2016. Following a brief stint with Potomac in 2017, RHP Sterling Sharp has spent the entire first half of the 2018 campaign with the P-Nats. In 12 starts, Sharp is 4-3 with a 3.65 ERA. Sharp has walked just 19 batters in 66.2 innings. Selected by the Nationals in the 22nd round of the 2016 MLB Draft, the righty has consistently posted a solid ERA at every level. In 48 career outings, 42 starts, Sharp has a 3.74 ERA over four levels. This is the first All-Star Game for Sharp. The third member of Potomac's five-man starting rotation to earn an All-Star nod is RHP Wil Crowe . Ranked by MLB.com as the eighth best prospect in the Nationals' system, Crowe has dominated the Carolina League throughout the first half of the season. In 11 outings, 10 starts, Crowe is 8-0 with a 2.56 ERA. He is tied with Winston-Salem's Dylan Cease for the league lead in wins, and currently has the eighth best ERA among qualified starters. Crowe has allowed two or fewer earned runs in nine of his 11 outings this season, and has held opponents to just a .223 batting average over 59.2 innings. This will be the 23-year-old's first All-Star Game. While the P-Nats have split catching duties between the two catchers on the roster, C Tres Barrera earned an All-Star spot with stellar defense and one of the best arms in the Carolina League. Selected by Washington in the sixth round of the 2016 MLB Draft, Barrera is set to appear in his first All-Star Game as a professional. The 23-year-old has hit .250 with three home runs and 13 RBIs in 28 games for Potomac. Barrera has just two passed balls in 238.0 innings behind the plate, and has thrown out 50% of attempted base stealers (11/22). It's the third best caught-stealing rate in the Carolina League, and best in the Northern Division. The top-ranked prospect currently with Potomac, SS Carter Kieboom started his first go-around in the Carolina League slowly, but has arguably been the best hitter in the league over the last six weeks, despite being the youngest player on Potomac's roster. Ranked as the third best prospect in the system according to MLB.com, Kieboom clocked in at just a .191 batting average through his first 26 games at the Carolina League level. Since then, Kieboom has hit .397 with six home runs, 28 RBIs, and 11 doubles over a span of 30 games. During this current stretch, the 20-year-old has a .471 OBP, and an OPS of 1.118. Kieboom is littered throughout the current Carolina League Leaders, as he sits ninth in batting average (.296), third in home runs (10), tied second in RBIs (43), third in hits (67), fourth in OBP (.386), second in runs scored (46), and tied third in walks (34). This will be Kieboom's first All-Star Game, though MiLB.com named him an Organizational All-Star following the 2017 season. 3B Jake Noll is the fourth 2016 Nationals MLB Draft selection named as a Carolina League Mid-Season All-Star for Potomac. In 58 games thus far in 2018, Noll has hit .300 with 18 extra base hits and 40 RBIs. He currently sits with the seventh best batting average in the Carolina League, and ranks second in hits (71). A seventh round pick in the 2016 MLB Draft out of Florida Gulf Coast, this will be Noll's first All-Star Game. The 24-year-old earned Post-Season All-Star recognition with the Hagerstown Suns in 2017, and was named an MILB.com Organizational All-Star for Washington following his 2016 season. The 2018 Carolina League All-Star Classic presented by US Foods® is scheduled to begin at approximately 7:00p.m. on Tuesday, June 19 at Five County Stadium.